My secret (and shameful) ingredient? Caramel flavoured icecream topping. I usually like to sweeten my smoothies with honey, however I randomly added sugar and a generous squirt of Cottee’s caramel topping into the mix and omitted the honey. It was fabulous. I couldn’t even taste the caramel, really, but it gave it a special kick. In fact, I couldn’t really taste any other ingredients… It didn’t taste like passionfruit, or avocado, or milk… Just nice and lightly sweet. It smelt avocado-y though… That was nice. 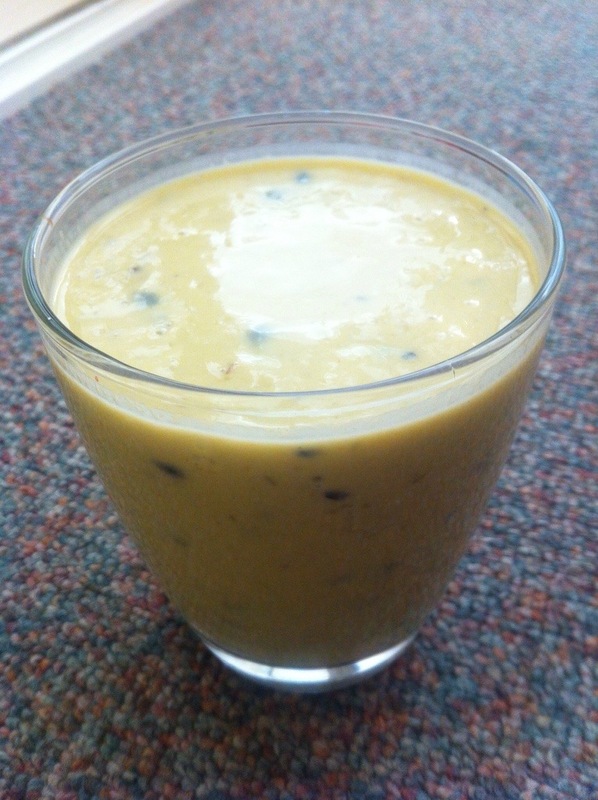 Slice open the the avocados and passionfruits and scoop out the fruity flesh into your blender. Pour in the milk and caramel. Give it a whiz. 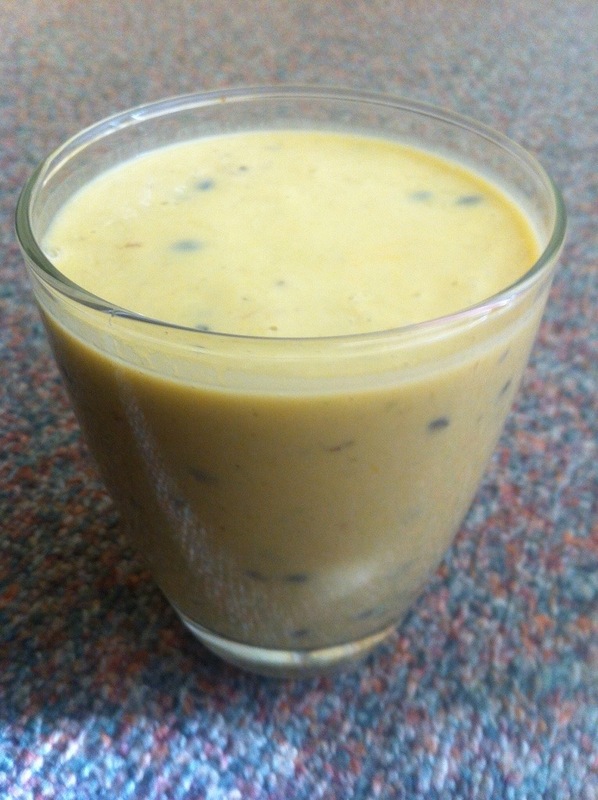 Taste the mixture and add the sugar if you want the smoothie to be sweeter. 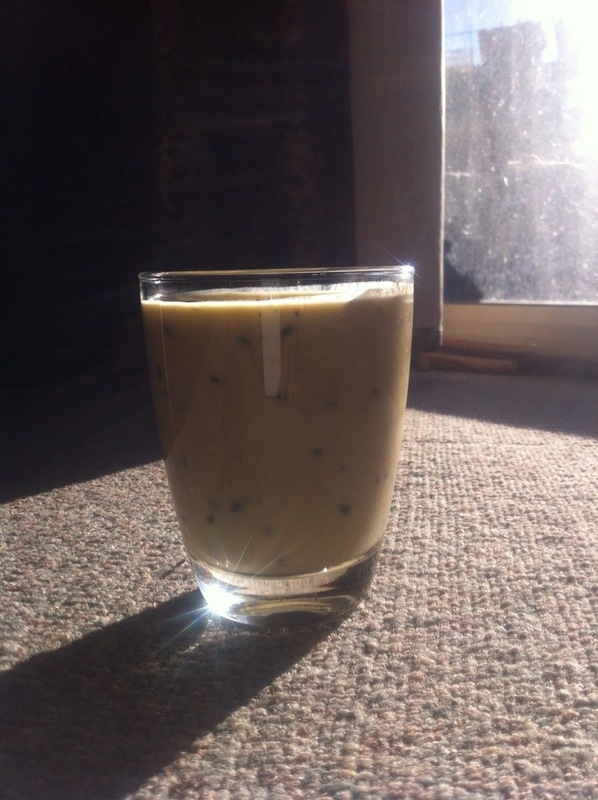 You can increase the amount of milk to yield more smoothie. My recipe yields one 320ml glass. I made it a second time with the remaining fruits, and gave it to my brother. Double the ingredients for two serves! You can use any caramel sauce, even one made from scratch. You might try yoghurt instead of milk, or both. I didn’t want to overpower the taste of the fruits here. You can use ice if your blender is powerful enough. If you don’t have a regular blender, use a hand blender in a jug or bowl. Previous Post White chocolate lime cheesecake. Next Post Creamy mushroom chilli garlic pasta sauce, with herbs.